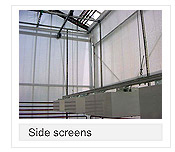 The technical solutions of screens are similar enough to inside shading. Screens are mostly made from semitransparent, closeness plastic net and they can effectively retain the heat because of the glitter yarns and metal bands woven in the strings. Under Eastern-European weather conditions it's highly recommended to use screens. In wintertime the really low temperature , in summer the high radiation makes protection and energy saving necessary.All kind of screens with different functions and quality are available. Through dutch partners' and self-experience we can help you to choose the best solution. 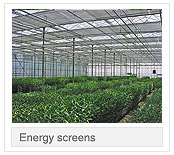 PDI energy screens can save up to 20-30 % energy besides shading effect can be 20-99 % depending on the request. In Hungary because of the local weather conditions ULS 16 és az SLS 10 screens are mostly used. 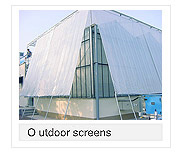 We can offer a lot of types of screen systems with different kind of fabrics for any demand. Sidescreens can ensure the steady temperature as there is no cooling from the sides and shading is maximal.